Coordinate terror attacks in the heart of Paris have at least 60 people dead and scores injured. 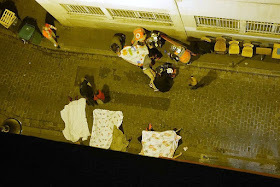 Dead bodies littered the streets of the French capital after terrorists killed at least 11 in a shootout in a Korean restaurant on the Rue Bichat. Another 15 in the Paris Bataclan concert hall where terrorists are said to be holding more than 100 people hostage. Terrorists also launched a total of six coordinated attacks at high profile sites, including the Louvre art gallery and the Les Halles shopping centre. The gunmen shouted 'Allah Akbar' and opened fire when they burst into the theatre, one witness said. There were also two explosions outside the Stade de France sports stadium where the French football team are playing a friendly match against Germany tonight. The restaurant shootout took place close to the Charlie Hebdo massacre in January. French President Francoise Hollande declared a state of emergency for the whole of France following what he called 'unprecedented terror attacks', and shut all of its borders with immediate effect.